Each disc moves freely, so speaker vibrations or the stirring of air will create whimsical flickers. This is not your freshman roommate's beer can art. Eco-folk artists Hannah Dreiss and Nemo turn recycled aluminum beer cans into this colorful mosaic. Each disc also moves freely, so speaker vibrations or the stirring of air will create whimsical flickers. 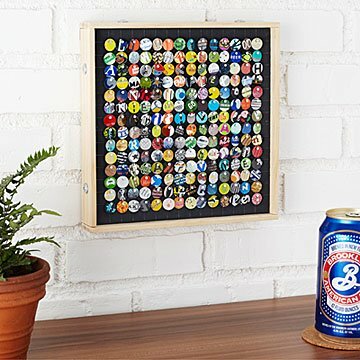 Playful and interactive, it's a unique piece that adds charm to any beer lover's den, game room, or craft brewery. Handmade in Texas.